I'm planning a 8 day trip starting July 15th and have some questions. I little bit of information first to answer some questions ahead of time. It will be me, my 18yo daughter, and 16yo son. All are experienced backpackers. We are also coming from Tucson, AZ so temps won't be an issue but I've included a couple short days in the beginning to help with altitude. We will be arriving early in the morning 5:00am to start our trip. I also have a permit starting July 15th from May Lake>Snow Creek. My biggest issue I'm trying to figure out is the vehicle drop off. We are finishing our trip at Tunnelview trailhead and I spoke with the rangers at Yosemite and they said I can leave a car at Tunnelview but I'm trying to figure out how to get from Tunnelview to our starting trailhead which is May Lake>Snow creek. Are there any shuttles that run within a couple miles of Tunnelview that I can catch back to the lodge or could we catch the backpackers bus as it is leaving the valley for Tuolumne Meadows? Day 1 - May Lake> Snow Creek Trailhead south to the top of Snow Creek Falls and camp near top of the falls. Day 2 - Take trail back up to the east junction that takes you past the Snow Creek Cabin then south to Mount Watkins. Plan on checking out the northeast buttress and then camping on Mount Watkins. Day 3 - East past Olmsted point then south to Sunrise Lakes. 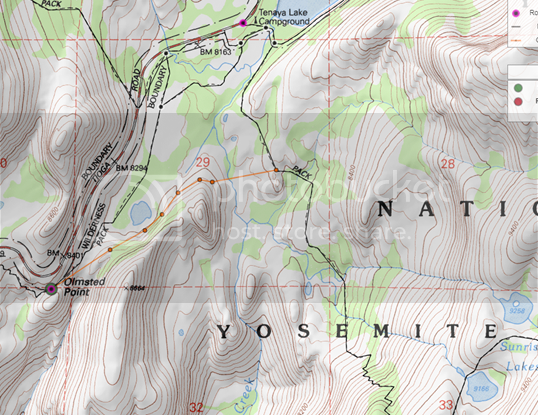 I'm looking at the maps and imagery and I'm wondering about being able to avoid the swamp of Tenaya Lake by hugging the high ground east of Olmsted/ Southwest of Tenaya Lake. Camp Sunrise Lakes. Day 5 - Clouds rest south then east along the trail that runs just north of Lost Valley to Echo Valley then west down Lost Valley camp near the footbridges near Bunnell Cascade. Day 6 - West through LYV, Panorama Trail, then south along Illilouette until legal to camp. Day 7 - Back up Illilouette to Pohono Trail and down Pohono camping at Bridalveil Creek footbridge area. (Only legal camping area along Pohono Trail. Day 8 - Finish Pohono to Tunnelview. This is our conservative or short route. If things go really well the 1st two days then we are looking at changing the middle portion. The change would involve hiking past Sunrise Lakes to Clouds Rest. The following day we would head to Cathedral Lake. Then the next morning either head for Rafferty Creek or go cross country to Echo Lake then down Echo Creek, through Echo Valley to camping again near Bunnell Cascade and finish as described above. Day 1 might work, if they are not prohibiting camping due to the pesky bear that tosses cans off cliffs. Your biggest issues will be creeks, if the snow is still melting they will be high. The backpacker bus leaves from the lodge, I believe, so not going to see it on the south side of the valley loop. Yes, you'll have to walk down to Bridalveil and catch the Valley shuttle up to Curry or at least the Valley Visitors' Center to catch the hikers' shuttle. From the current closures, it does appear that the flats at the top of Snow Creek Falls is closed. Unless they shoot the bear (now apparently bear(s)), it's probably going to stay that way for the foreseeable future. If you really want to avoid that area between Olmstead and Tenaya, you can take the Tuolumne Meadows shuttle, but the driver is going to laugh at you. But the trail does tend to stay higher, except for the last 1/4 mile or so on the floor. Technically exits the wilderness and nullifies the permit - the road is not wilderness, turning and walking or riding down it is leaving the wilderness. Crossing it is continuing on a trail with a brief interruption. AlmostThere wrote: Technically exits the wilderness and nullifies the permit - the road is not wilderness, turning and walking or riding down it is leaving the wilderness. Crossing it is continuing on a trail with a brief interruption. True. I'm totally joking. But it would be, not only funny and outlandish, but like some kind of bad American literary theme where they're waiting for you to get off the bus to tell you that they don't like your kind here. "Git back on up thar and hike that last 1.5 miles, boy." Last edited by Phil on Tue Jun 27, 2017 9:39 pm, edited 1 time in total. Sorry I guess I wasn't clear about the area east of Olmsted. I've heard that the area west of Tenaya Lake that the trail passes through is a swampy mess during this time of year. I was thinking about going off trail east of Olmsted and hugging the peak that is east of Olmsted. Then crossing Tenaya creek at the southwestern edge of the meadow if that makes sense. No, like I said, it does generally stay higher for most of the trail. Don't second guess the normal crossing. Everything to the south of it puts you through boggy meadows before you even get to the creek. And it widens out. Go too far looking for a better place to cross and you get closer to waterfalls at the top of Tenaya Canyon. The crossing at the Sunrise trailhead is the best place. Phil wrote: No, like I said, it does generally stay higher for most of the trail. Don't second guess the normal crossing. Everything to the south of it puts you through boggy meadows before you even get to the creek. And it widens out. Go too far looking for a better place to cross and you get closer to waterfalls at the top of Tenaya Canyon. The crossing at the Sunrise trailhead is the best place. Ok, thanks. I posted a picture showing the route I was considering but if heading all the way up and not "cutting the corner" is better then we will go with that plan. If there are going to be mosquitoes and wet conditions, those aren't just alongside the creek or the valley floor. Even after the crossing at Tenaya Creek, when drainage is happening, it comes from the uphill north side of the trail for quite some distance. It's usually about several hundred yards, if not more. If you also notice, the general route of the main trail more or less begins a traverse of the contours in a SE direction. That's because the downhill slope is steeper than it may look on the map, not to mention, a maze of brush, boggy areas, downed trees, rocks, and all the things that make even animals walk on established trails. There are plenty of places where cross country travel is fun and beneficial...this is decidedly not one of them. The other thing about Tenaya Creek at and below the crossing is that, even though it's sometimes wide, that particular spot has very little flow going and is essentially just a continuation of the lake itself, especially when the water is high. As you go downstream, the channel not only deepens, the current begins to pick up measurably. Believe me, after coming up from Watkins and still facing the climb up to the top of Sunrise, the last thing you'll want to do is dilly dally and go route finding in that valley. All danger and hassle aside, it's not worth the time or extra effort. Just keep to the trail, walk higher ground if/when you need to, get it over with. Having done a lot of cross country "short cuts" I can only add that the time you spend off trail you should expect to take at least twice as long to go the same distance you might have done on a trail. What's not on the map are those little 10-20 foot cliffs, the field of erratics (boulders left behind by a glacier), the grove of trees, the fallen trees, the tiny ups and downs that add up to something, and fields of pebbles on granite slab we fondly call "Sierra roller skates" that when sufficiently steep become fun filled rides. I'm not saying that little side trip will be like that. Just that you shouldn't be surprised if you are looking down at something like that... it's fun, really. Honest. Actually you aren't really coming up from Watkins to Olmsted, you descend into a nice wooded area that can be swampy in a dry year. The bugs and fun down there add to your Sierra experience. Then you come up to Olmsted, hiking in granite slab through the field of marmots and tourists, as they veer away from you (backpacker stench gets you great seats on shuttles!) and cross on trail to walk below the road over to Tenaya Lake. The mosquitos are there, yes, when the breezes die down. Once at the lake you will take a glorious picture of the lake from the outlet and wash your face in its calm waters. Reapply your DEET and put your headnet back on. After a refreshing slow wade across you continue on the trail up another ridge toward more forest and pass the little unnamed ponds full of mosquitos on your way to clouds rest. I've never found a way to avoid mosquitos, really. Other than headnets, long loose sleeves, and DEET. This is by the way not how I think it will really go, but how it has gone, many times, for me. How it'll probably be for me miles south of Yosemite this weekend, in fact, along with some great wading through meadows that are unavoidable. That valley is tougher than it looks. Very dense. AT's right, it's all the stuff that doesn't show up on the map or sat images that gets you. You'll look down from Olmstead when you get there and realize that the trail will be faster and easier. I guess it's my turn to clarify again. If you come over cross country from your stay at Watkins, it's down. If you leave via the same way you came up from the trail junction/ranger's cabin, you do have to climb. That part of the trail isn't so bad, but stay higher, work less, have a better day. No, you won't escape the mosquitoes. If you don't walk through clouds of them, the clouds come to you.